The Junior football team will play Bunclody at 6.45 pm (not 7.30pm as previously advertised) on Friday in Monageer. 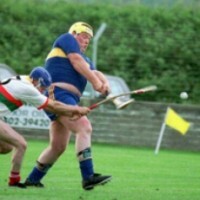 The Intermediate hurling team have a practice match on Sunday against Rathnure at 5pm, in Rathnure. The Junior hurling team have a practice match on Saturday against Oulart at 6pm in Monageer. The third hurling team were our first team to play this weekend and they won well against Marshalstown’s second team in Farmleigh on Saturday. The final score in this match was Monageer Boolavogue 4-14 to Marshalstown 1-12. We started well with three points from Morgan Rowsome but it was the first goal of the game from Walter Christopher which had everybody talking. A ball was played in towards the square from the right wing, when Walter made a terrific one handed over head pull to send the ball crashing into the net leaving the goal keeper helpless. Moments later we had a similar score from Micheal Somers, who made a one handed pull from a long ball sent in from midfield which ended up in the roof of the net. Barry Millar completed a great run of three goals in the space of a few minutes and by this stage we were looking very comfortable. The half time score was 3-09 to 0-06. Marshalstown fought back in the second half but our half time lead was too large for them to get closer than 10 points and we eventually ran out 11 point winners. Our first team played against Buffer’s Alley’s second team on Sunday and lost by 1-12 to 1-11. Our lads didn’t perform very well on the day but were still in with a shout right until the end, we probably deserved a draw because Buffer’s Alley’s last point went wide. Scores: Niall O Loughlin 1-8 frees, Bertie Gahan 0-01, Peter Mernagh 0-01, Mark Walsh 0-01. The Second team played Shamrocks second team on Sunday evening and lost out on a scoreline of 0-10 to 1-04. Our lads never really got going and many chances weren’t taken during the game. 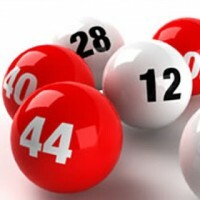 Next draw on Tuesday 3rd April 2012 at 9.30pm in GAA complex. All are welcome. Monageer Boolavogue beat Ballyfad in the league today by 0-09 to 0-05. It was a low scoring game played in very bad conditions but our lads were well deserving of their win. Our Second team played Cloughbawn this evening and lost out on a final score of 2-15 to 3-09. Our lads were 12 points down at half time and showed good determination to get within three points by the end. Our third team also played in Cloughbawn and suffered a big loss. The final score was 3-16 to 3-03. Special Mention should be given to Micheal Somers who bagged 2-01 and William Murphy who got a goal on his debut. 1. Sean McCabe 2. Martin Sweeney 3. Padraig Stafford 4. Anthony Dempsey 5. Colin Hawkins 6. Barry Millar 7. James Gahan 8. Morgan Rowsome (0-2 frees) 9. Micheal Stafford 10. Patrick Walsh 11. Aidan Gahan 12. Laurence Murphy 13. Walter Christopher 14. Micheal Somers (2-01) 15. William Murphy (1-00) Sub: Ed Rowsome for James Gahan. Please Note that the Intermediate League Match against Ballyfad is now on Saturday the 17th of March at 11am in Killenerin. Big weekend ahead for our Junior hurling stars, the league kicks off with a double header in Cloughbawn on Saturday (the 17th, yes Paddy’s day !) at 3.30pm and 5.00pm. See the fixtures page on website for further details. The Intermediates are out too, up in Ballyfad (for their annual trip) on Monday 19th at 2pm. You spend all winter on the beer speculating on who will be brought in to manage the junior hurling team next year. The hardest tackle you will make all year is in an indoor soccer match in January when you break your brother-in-law’s leg. Your tight marking corner back never gives an inch – except of course, when the ball gets inside his own 50 and he charges out after it with all the other backs, forgetting that the other team are even on the field. The more people instruct you to “let fly if you don’t get it up the first time”, the more you ignore them. As part of the registration night, a presentation was made to the Hope Cancer Support Center. 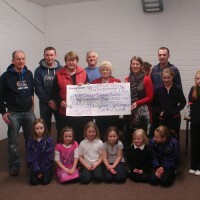 A total of €730 was raised during the Liam Cooper Memorial Cup game, held on St.Stephens day. The presentation was made by Roisin Cooper to Margo Kehoe and Ann Marsh of the Hope Cancer Support Center. Thanks to both Damien Fenlon and Stephen O’Leary for organising the match on St.Stephens day. Big thank you to all who took part. 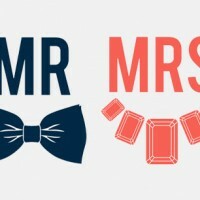 The ever popular Mister and Missus show is getting a Monageer/Boolavogue GAA makeover ! On March the 17th six (well 5 at the moment) couples will see exactly how much they know about each other (or not), in front of a live audience in the Monageer Tavern. The show starts at 9pm on St Patrick’s Day in the Monageer Tavern. Next draw on Tuesday 20th March 2012 at 9.30pm in GAA complex. All are welcome. 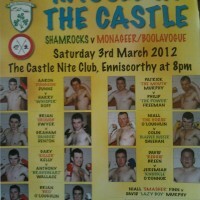 Last night saw our lads take on the Shamrocks in the now famous “Hassle in the Castle”. Unfortunately the overall result didn’t go our way, with the lads losing 7 to 4. However, considering we only trained for four weeks and it was our first outing in the “ring”, all our boxers gave a great display and should be proud of their efforts. A great night, enjoyed by all and who knows with another months training ….